a new drumtalk special released: Devin Townsend! episode 42 released: Eloy Casagrande! episode 41 released: Aaron Spears! 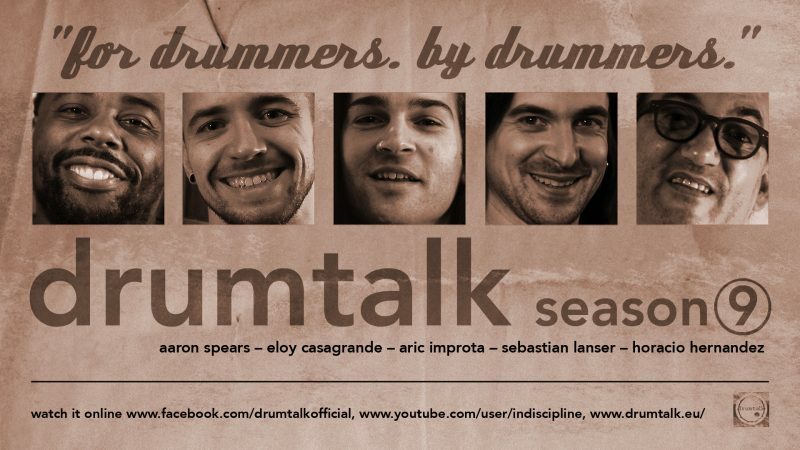 drumtalk [season 9] TRAILER online! episode 40 released: Virgil Donati! episode 39 released: Pete Sandoval & Lee Harrison! episode 38 released: George Kollias! episode 37 released: Iggor Cavalera! drumtalk interview in German Sticks magazine!!! drumtalk [season 8] TRAILER online! Virgil Donati – The Dawn of Time [drumtalk special] released! Pete Sandoval & Lee Harrison in drumtalk’s [season 8]! next entry for the upcoming [season 8]!!! Stewart Copeland going to be in drumtalk’s [season 8]!!! episode 35 released: Joey Jordison! episode 31 released: Dave Lombardo! episode 30 released: Steve Gadd! episode 29 released: Oli Beaudoin! episode 27 released: Kerim KRIMH Lechner & Ken Bedene! episode 26 released: Dave Weckl! drumtalk [season 6] trailer released! episode 25 released: Hannes Grossmann! episode 24 released: John Longstreth! episode 23 released: Patrice Hamelin!